My post is a little late this week, but there’s a reason – it’s All Saints’ Day, one of my favorite festivals of the church year. It’s a day when we remember ALL the saints that have gone before us, not just the “historical” ones who have their own feast days. I’ll be honest – part of why I like it is because it’s the one day we are absolutely going to sing the great Ralph Vaughan Williams hymn, “For All The Saints” (lyrics by William How, a mid-19th century Anglican bishop). There has been controversy over the centuries when it comes to the saints and how we regard them. When I taught music and liturgy at a Catholic school, the supervising priest always made a point of explaining to the kids that we don’t pray TO the saints, but ask them to pray for us – much as we’d ask a friend to do. He emphasized that the “praying to” was for God – Father/Son/Holy Spirit. Many churches have experimented with various ways of remembrance on this day. The simplest, and probably most widely used, is the practice of reading the names of congregation members who have died in the previous year. Some years ago, my congregation set up tables for people to set up pictures of those whom they considered to be in their own “cloud of witnesses.” These tables eventually moved to the front of the sanctuary, and we saw pictures of people who had recently died, those who had died long ago, historical figures – it was a fascinating assembly. In the last few years we have had places where people can light a candle in remembrance. The candle thing, while well received, is messy and dangerous on Sunday morning. We were having people light candles within the communion distribution time, which made for a crowded area around lit candles. This year we are working with the idea of placing a small stone as representative of someone in our cloud of witnesses – someone who was a rock for us as we grew in faith. I read a story about saints this week that reminded me (yet again) why it is so important to understand our traditions and the stories and history they bear for us. It is a story about theological architecture. (In addition to being a church music geek and a constitutional law geek, I am an architecture geek.) Specifically, it is a story about communion rails – the railings where one kneels to receive Holy Communion. I’ve never been a fan of communion rails. To me they always represented a barrier to God, a point of division between us parishioners (peasants, perhaps?) and the clergy (always standing on a platform above us). They’re also one more piece of furniture to maintain. The story is about the old Evangelical Lutheran Church (ELC, of Norwegian origin) congregations in the Midwest. Most of them embraced a form of architecture that elevated the chancel area (where the altar, or table, is) and placed a half-round communion rail in front of it. The elevating of the area was likely for sightlines. The half-circle communion rail, however, was understood to be only the visible-to-us part of a full circle. The “departed saints” were believed to be kneeling at the unseen part of the railing, on the other side of the table. 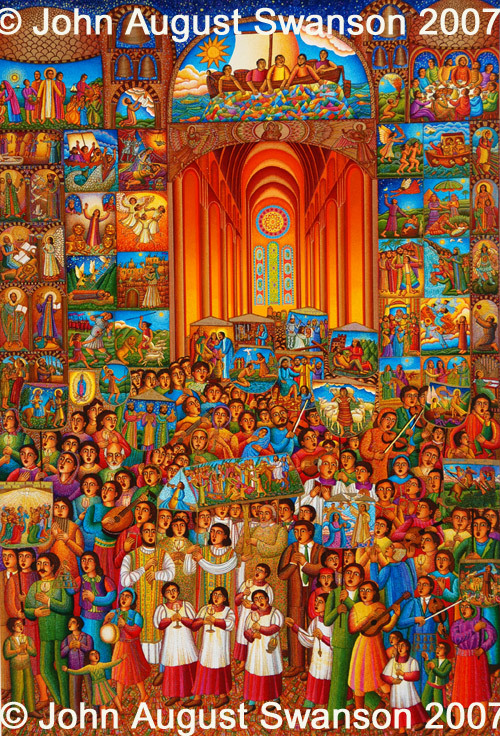 Stop for a moment and think about the term of our faith “the communion of saints” – the saints here on earth, connected with the departed saints by way of the table and the love of Christ. Now think about the term “foretaste of the feast to come.” This is the Eucharist, Holy Communion. The departed saints have already been seated at the feast to come, on the far side of the table. We are on the near side, with just a foretaste. But what a breathtaking idea, to consider that as we come to the table those who have gone before us are seated at the unseen side. May the church still waiting for you/keep love’s tie unbroken, Lord. I remembered what my colleague had said when my husband died, about him being welcomed to the far side of the table as they were gathering for Communion on the near side of the table. I thought about what it might look like if the tables for photographs on All Saints’ Day were arranged so that they gave the impression of the unseen half of the rail. And then I thought about what a massive crowd it must be on the far side of the table! Singing to Father, Son and Holy Ghost: Alleluia! I invite you to ponder this the next time you are at the Lord’s Table. I leave you with a beautiful picture by John August Swanson, called “Procession”, that is a powerful vision of the saints coming to the other side of the table.